So far this year we have seen the openings of restaurants by a few prominent chefs: first Dinner by Heston Blumenthal, then Pollen Street Social by Jason Atherton, and then in May The Gilbert Scott by Marcus Wareing. And most recently, it’s Simon Rogan (from the Cumbrian one Michelin-starred L’Enclume ) who opened the restaurant Roganic in Marylebone. It’s a two-year “pop-up” restaurant venture – meaning that it will be gone in two years time, when the lease is up. I knew I would plan to visit this place at some point later on this year, but I certainly did not expect to pay a visit only three weeks after its opening. It was a rainy Saturday, I had not done my food shopping for the weekend, the fridge was completely empty (most unusual) and I just couldn’t be bothered to face fighting my way round the supermarket. So the next hard task was to decide where to go for dinner. 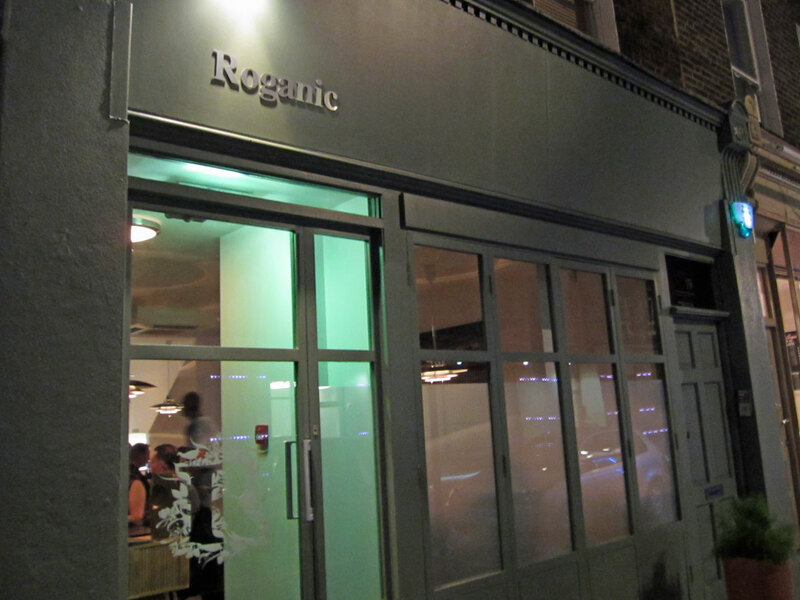 I didn’t expect any tables available at Roganic but I thought I’d try my luck anyway – and I was glad to have made the phone call as there was a table for two the same evening. The restaurant was not huge – seating for approximately 20-25 people. The decor and setting reminded me very much of L’Enclume, and maybe a little bit warmer and more cosy than L’Enclume – but then my last visit to L’Enclume was in November 2010, when Britain was hit by the heavy snowstorm and extreme cold weather. 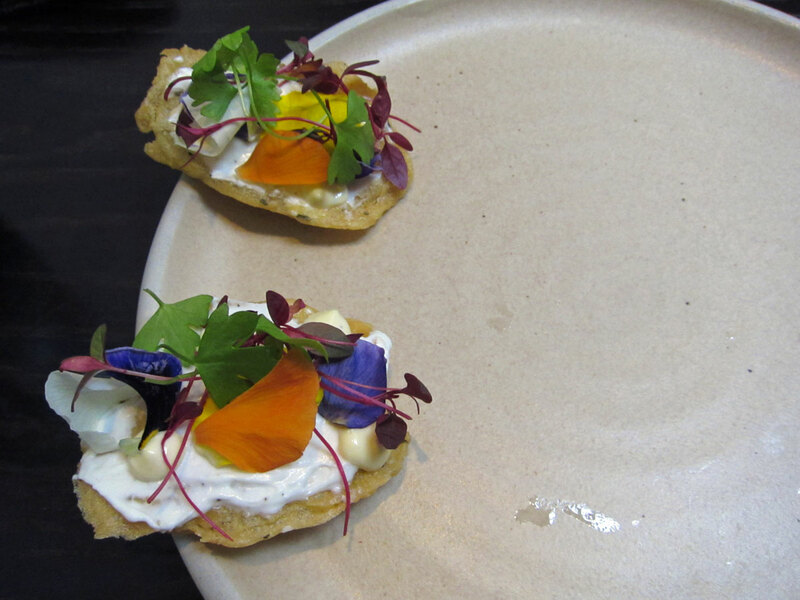 After ordering some Philipponnat champagne, the amuse-bouche was brought to the table: Rosemary and chickpea with aioli on crisp bread. The vibrant colours certainly made it memorable in terms of presentation, and it tasted just as nice as it looked – the garlic aioli flavour did not overpower the freshness of the other ingredients, and the mouth was left with a surprisingly refreshing aftertaste. 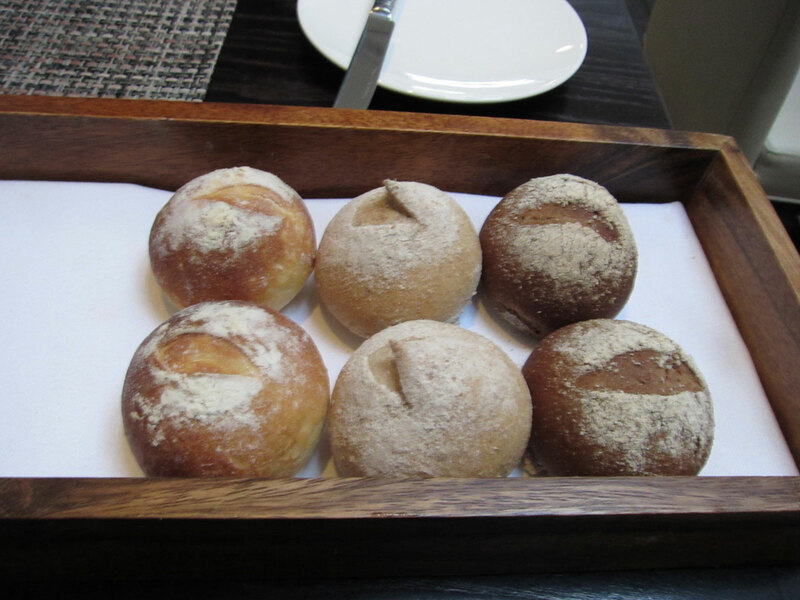 Just like L’Enclume, there was a wonderful array of bread. This evening we were presented with potato bread, spelt bread and pumpernickel bread, fresh baking hot from the oven. 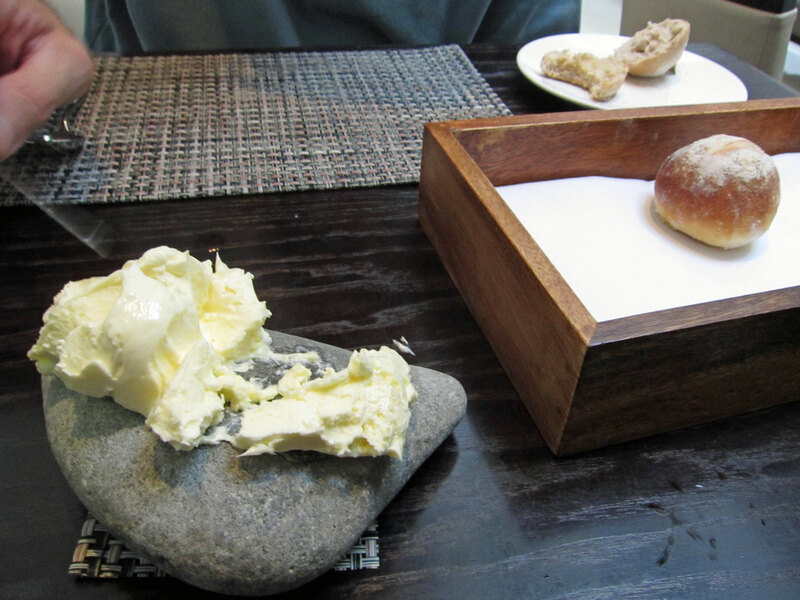 A massive dollop of butter was placed on the stone on the table – and at first I thought “what a waste of butter”. 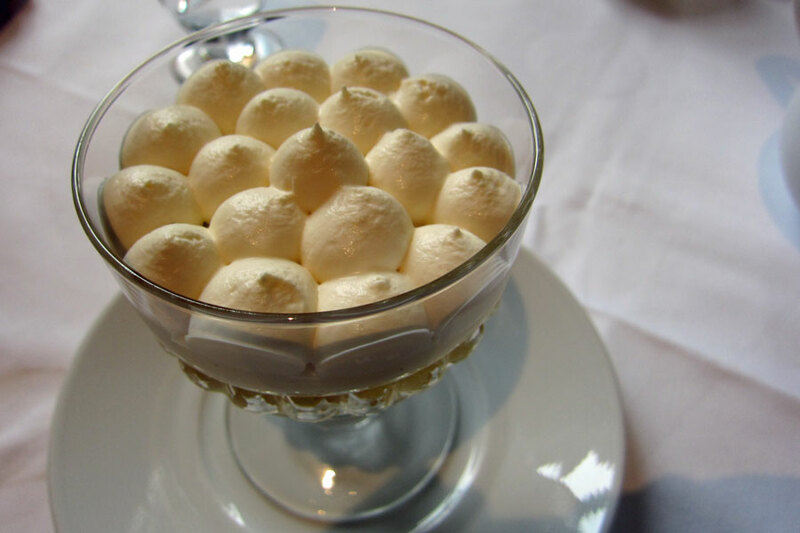 But then when we tried the butter, we couldn’t get enough of it – the butter was churned to a soft whipped-cream texture at the restaurant, with Maldon salt added to it to give that slight saltiness and crunch. It was so delicious that we ended up eating 11 bread rolls between us and had a second helping of butter during the whole dinner. 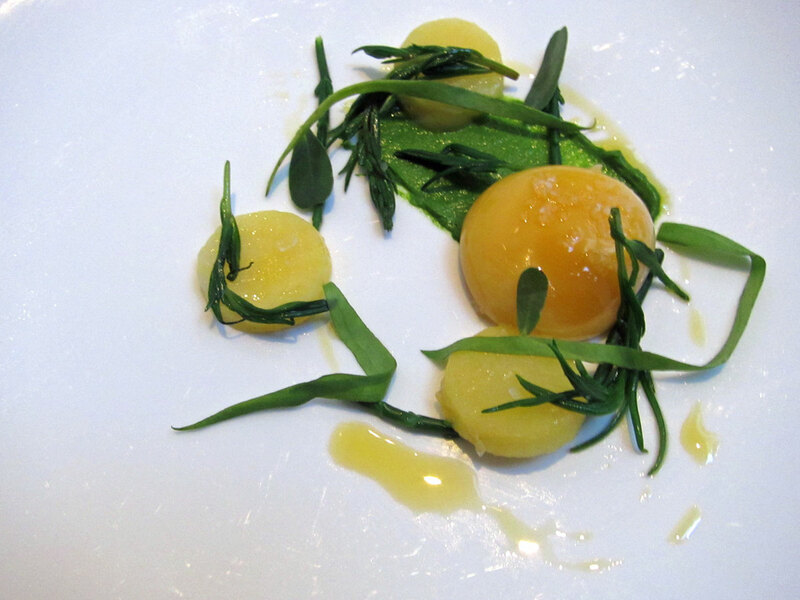 The first two courses were broad bean and hyssop, fresh curds and beetroot; and Rubin turnip baked in salt, smoked yolk, sea vegetables and wild mustard. 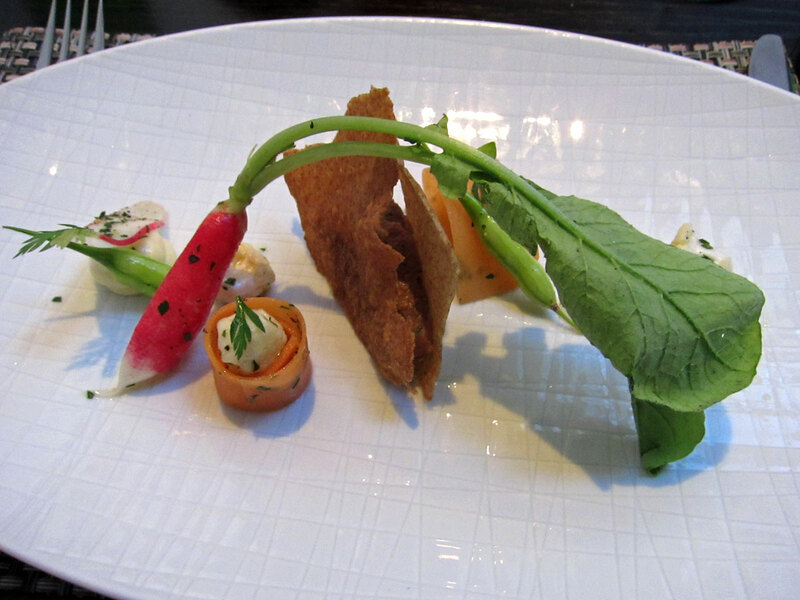 Both courses were so colourful and presented so beautifully that they looked like pieces of art that I could just look at and admire for a long time. 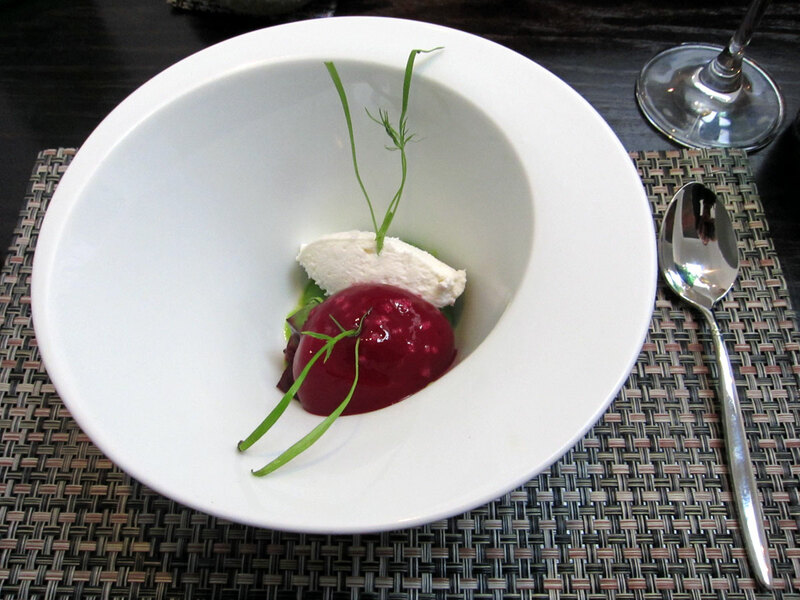 In terms of taste, the beetroot and curd in the first course went surprisingly well together. The smokey egg yolk in the second course was cooked perfectly – still warm and slightly runny, and with a very distinctive smokey flavour to it. 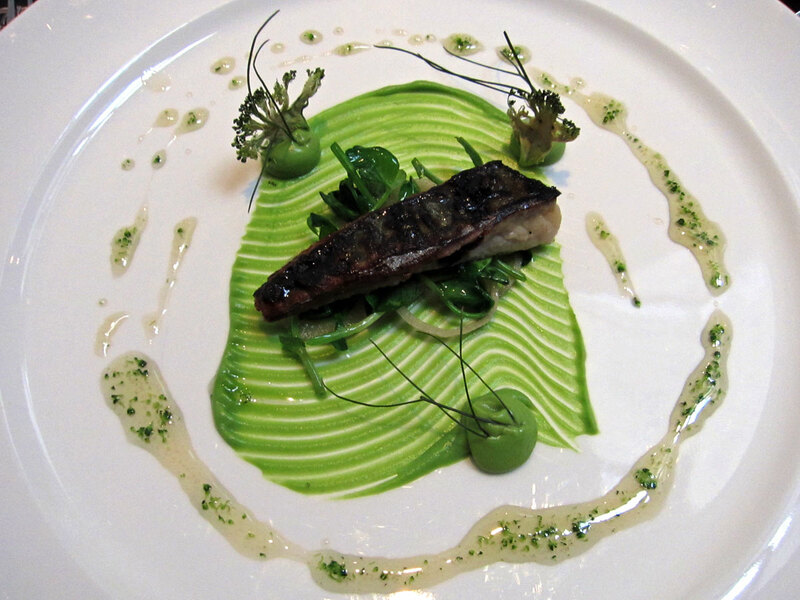 The next course was seawater cured Kentish mackerel, orache, broccoli and warm elderflower honey – the sweetness of the honey balanced well with the oily strong-flavoured fish, which was perfectly cooked. The thinly sliced dried broccoli and the pattern on the plate augmented the look of the dish – it looked as if the fish was swimming in between the coral reefs in the sea. At this point I was already impressed with Roganic – I didn’t expect the food to be this good when it’s only opened for three weeks, and the dishes were not that straightforward to put together. The next course was shredded ox tongue, pickles and sourdough paper – it was interesting, with the ox-tongue that sandwiched between the sourdough paper reminding me of potted meat that I used to have when I was young. 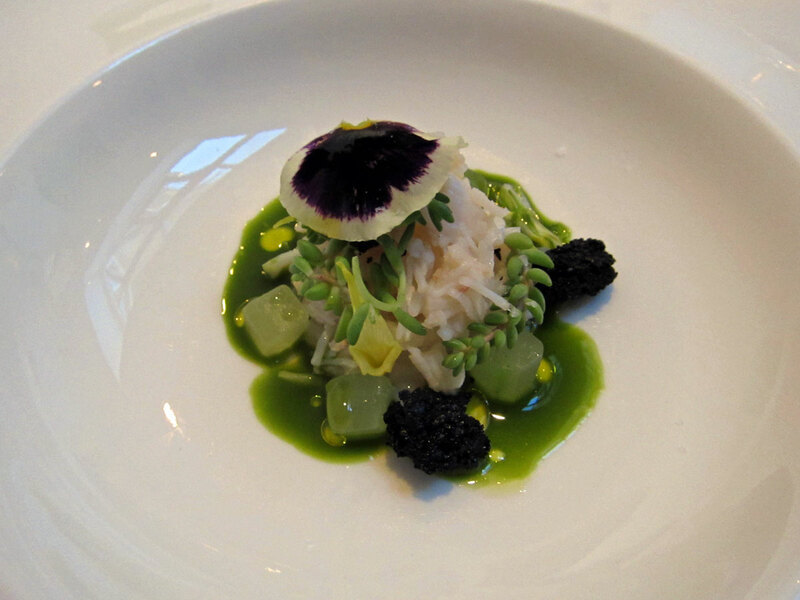 The next course was probably the biggest surprise of the evening: flaky Crab and mallow cream, young squid and cucumber. It was refreshing and had a pleasant aroma that transported my mind to the seaside – it was as if I was eating this dish at an open-air restaurant by the sea. The squid ink croutons gave the crunchiness to the perfectly-cooked pieces of crab meat and squid. It was a truly memorable dish. 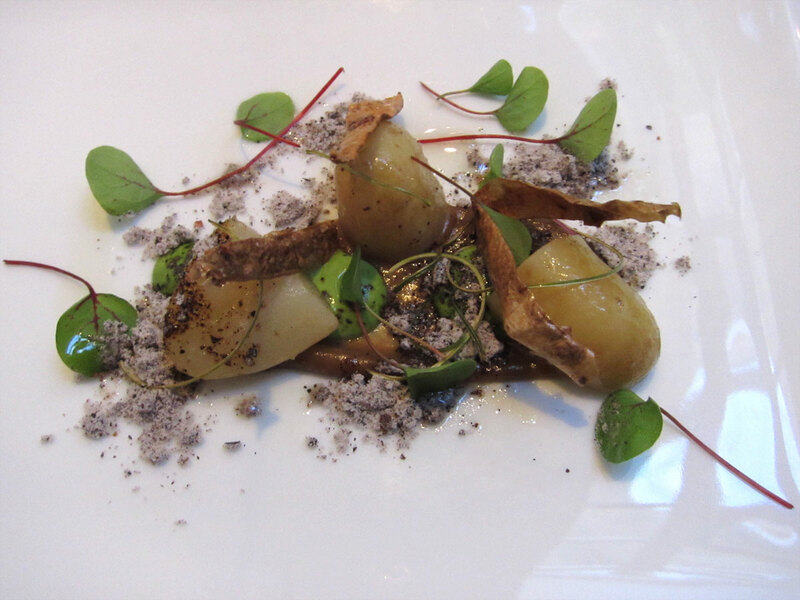 The next course was one of the very few dishes that featured on both L’Enclume and Roganic menus: vintage potatoes in onion ashes, lovage and wood sorrel. This was supposedly to be one of the signature dishes, but I must say that I was not that keen on it – as much as I liked onions, the dehydrated onion with the onion oil drizzled around the potatoes was just too strong and had a taste that reminded me of something I was not keen on when I was younger. 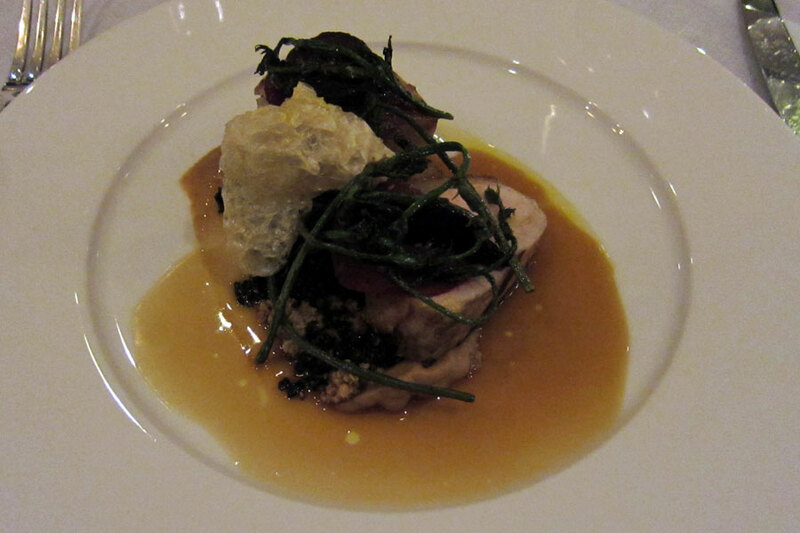 The 7th course of the evening was roasted monkfish, chicken salt, mushroom and fennel leaves. While the monkfish was cooked slight a bit too much, it was made up by the bold and intense flavour of the stock and the salt made from chicken skin. 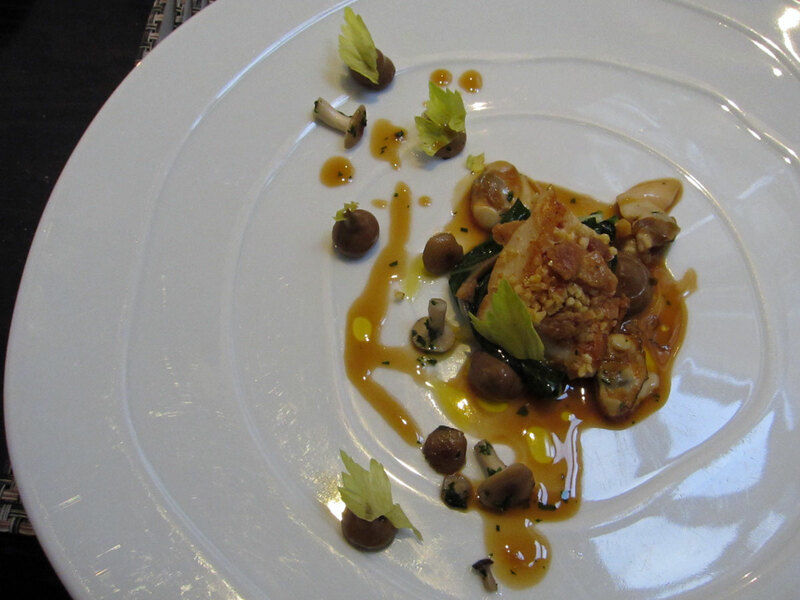 The mushroom puree and the fennel leaves provided another dimension of strong taste to the dish. Overall a combination of flavours that worked well together. 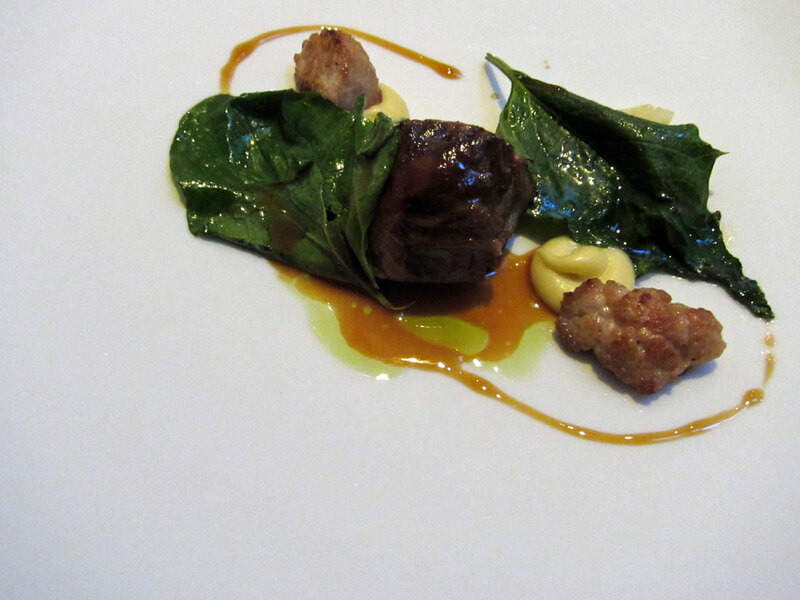 The last savoury course was Cumbrian hogget, artichokes and chenopodiums. A rich flavour of the hogget with the sweetbreads on the dish, but it was just too salty for my liking – to the point where it left a bitter salty taste after finishing the dish (and so thirsty on the way home that I couldn’t stop drinking water). For the desserts, the first one was sweet ciceley with strawberry, buttermilk and verbena – the macerated strawberries were refreshing (very welcoming after the previous dish) and went well with the strong perfume flavour of the verbena and mint. 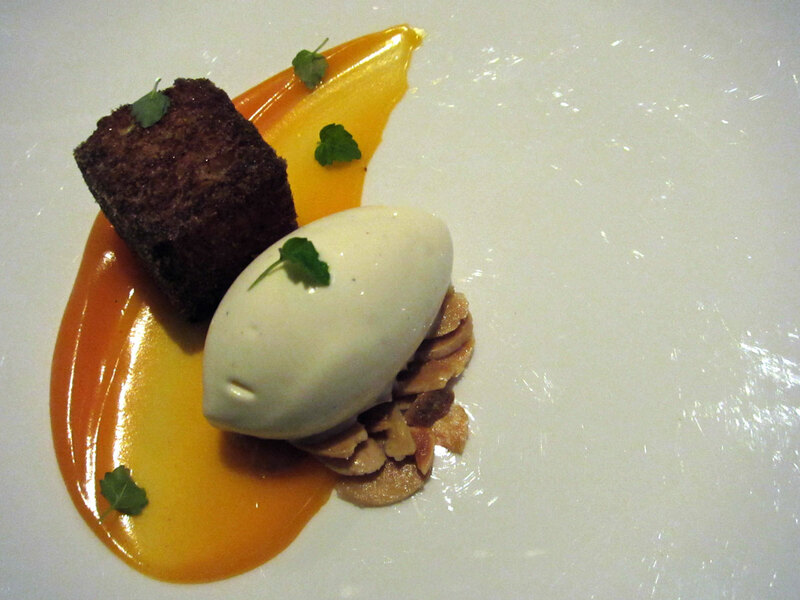 The finale was warm spiced bread, salted almonds, buckthorn curd, smoked clotted cream – I was dreading this dish because I didn’t like the buckthorn at L’Enclume. Each ingredient on its own sounded (and actually tasted) a bit ghastly, but together they were like match-making in heaven. It was a bit like the magic bacon and egg ice-cream at The Fat Duck. The dish was not too sweet and was a good finish to the meal. Afterwards we were brought the Douglas Fir & Pine milkshake with Douglas Fir flapjack. The milkshake was something I had at L’Enclume. The flavour of this one still reminded me of some medicine I had when I was young – but it was not at all unpleasant. To finish off this suprisingly good meal, we ordered some tea that was made specially at the restaurant, using a mixture of verbena, douglas fir, and other herbs. 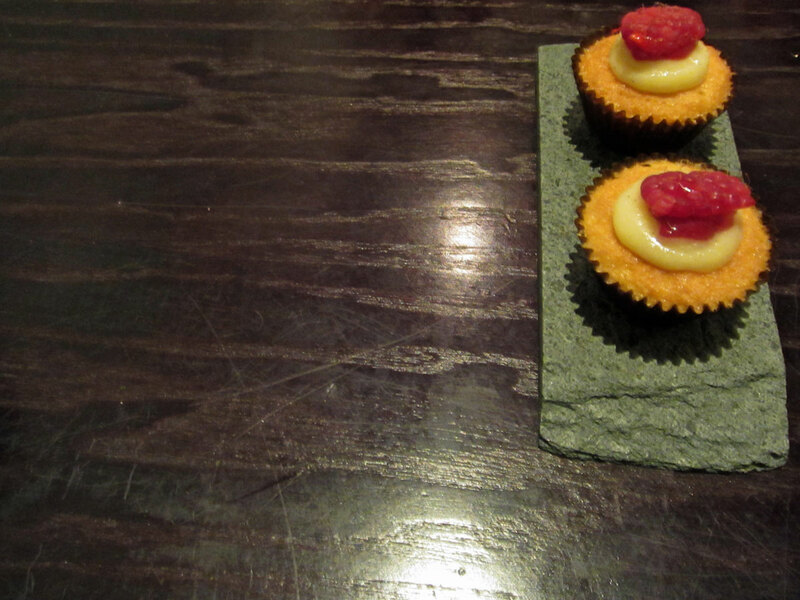 To go with the tea, the petit fours were some mini Victoria sponge cakes topped with raspberries. On the whole, it was a nice meal – apart from the hogget which was too salty for my taste, the rest of the dishes were nicely flavoured, and there were some very memorable dishes. There’s always going to be a comparison between Roganic and the older brother L’Enclume – while some people might claim that L’Enclume was more adventurous and experimental, personally I found that at Roganic the food was less salty (apart from the hogget), and a slightly warmer decor and service. For Londoners who can’t be bothered to venture all the way up to Lake District, Roganic is certainly a well-worthy alternative. It’s a place I’d certainly be back – now I just need out-of-town visitors to give me my perfect excuse to return to this restaurant in the next two years. Originally I was meant to be going into Soho for a quick fix of my sushi craving on a weekday evening with Russell. Then we thought that since it’s early maybe we could get a table at Arbutus without reservation. But as we walked down Soho Square, he said “Oh there’s this new Thai restaurant on Frith Street, shall we go and have a look?” – so somehow a last-minute joint decision meant that we ended up at At Siam (@Siam)! We were greeted by the staff as soon as we stepped through the door, even though the restaurant already had quite a few customers. The decor was less traditional Thai, but more modern design with a hint of Thai incorporated. The menu was not huge but there were more than enough dishes for us to exercise our brains in choosing. 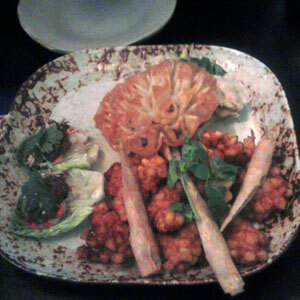 Our starter was Ruam Mittr, an assorted selection of Thai appetisers with salad. I was surprised by the generous portion, with no less than 8 pieces of the corn fritters for a start – do they somehow know that I just love corn fritters? The yam spring rolls were interesting enough. 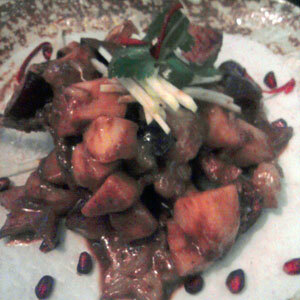 The chicken satays did not have enough spices in the marinade, resulting in a more bland taste. The prawns and salad on the lettuce leaves tasted good and refreshing. As soon as we finished the platter, we were presented with Yum Pu Nim Tod Krob, which was the battered soft shell crab with chilli jam and mixed vegetable salad. Maybe it would have worked better with the soft shell crab on top of the salad, with the chilli jam on the side, as the batter was rather soggy when we had it. Still, the salad was itself was good, with more unexpected ingredients like pear and pomegranates. We had two main courses to share: Kae Padd Prik Thai Dum (stir-fried lamb with black peppers and Thai seasoning) and Gaeng Phed Ped Yang (roast duck red curry with lychees and pineapples). Both were nicely flavoured, without the spices being too over-powering. With the sticky rice to accompany these two dishes, there was no leftover. On the whole this was a welcoming addition to the Thai restaurant brigade in Soho – I more or less gave up eating Thai food in Soho with the demise of Sri Siam and then Thai Pavilion quite a few years ago… But maybe now there’s one that I can go to again. At the rate the team behind Polpo opens new restaurants in the West End, I would not have thought of going to their 4th restaurant da Polpo so soon after its official opening. I love Polpo: every time I take someone there, it never disappoints. I was slightly less impressed with Polpetto last time I went – it was not just me; my friend Axel who went to Polpo with me on a previous occasion agreed that Polpetto was good, but just not as good as Polpo. I met up with Priya on this sunny Friday in the West End for lunch, and originally I was thinking of going to Polpo again; but then I thought – let’s risk da Polpo and see what it’s like in its first week. The first thing that I liked about da Polpo was that it’s light and spacious – unlike the somewhat darker look of Polpo and the crammed dining area in Polpetto. The menu looked somewhat familiar, with some dishes at the other restaurants also. Service was attentive, and we got our drinks and the free focaccia (that’s fresh and delicious) promptly. Choosing the dishes was not so easy – not because there’s not enough to choose from, but it’s more like how to be sensible and not over-order, with so many choices in front of us. I would have been quite happy to close my eyes and just point randomly! The two potato and Parmesan crochettas came first to fill the two empty stomachs. They were crispy on the outside with a very smooth, slightly runny and piping hot mashed potatoes inside. Probably amongst some of the best croquettes that I have ever had. 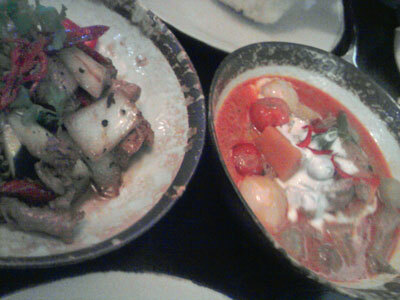 The next two dishes arrived simultaneously – the fragrance was already showing promising signs even before tasting. The tasty lamb and mint meatballs, with a tomato-based sauce, were of a generous portion, and I could have eaten anoter place of this without any hesitation. 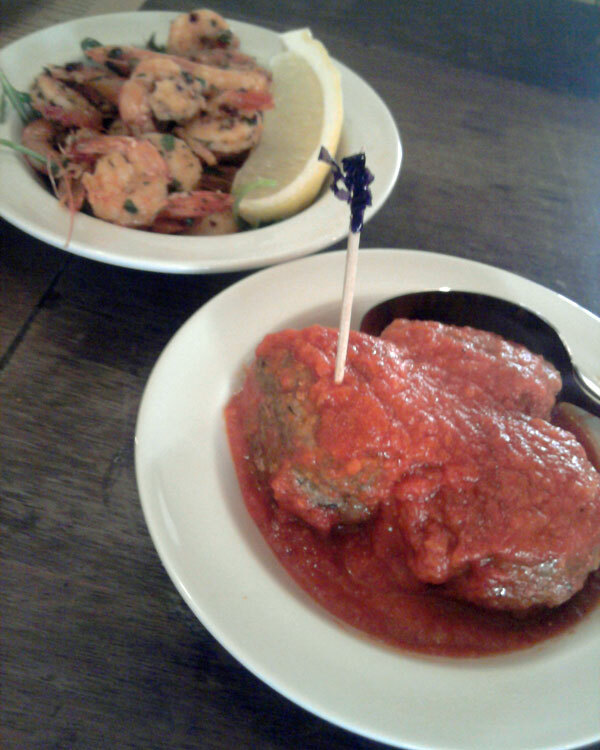 The chilli and garlic prawns were good too, though I would have prefer the prawns a bit larger. 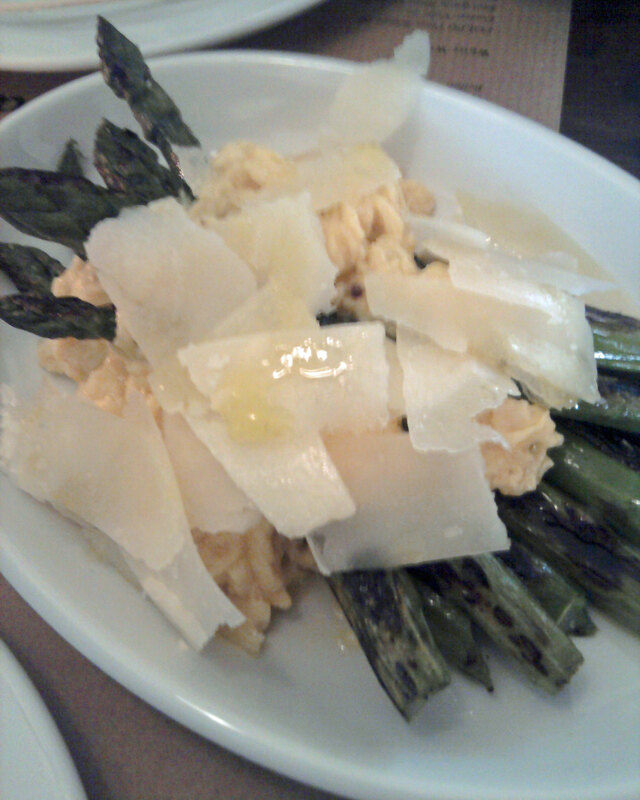 As it’s still the asparagus season, we thought it would be a good idea to order the grilled asparagus, buttered eggs and Parmesan. Again it’s a generous portion and the combination was simple but effective. 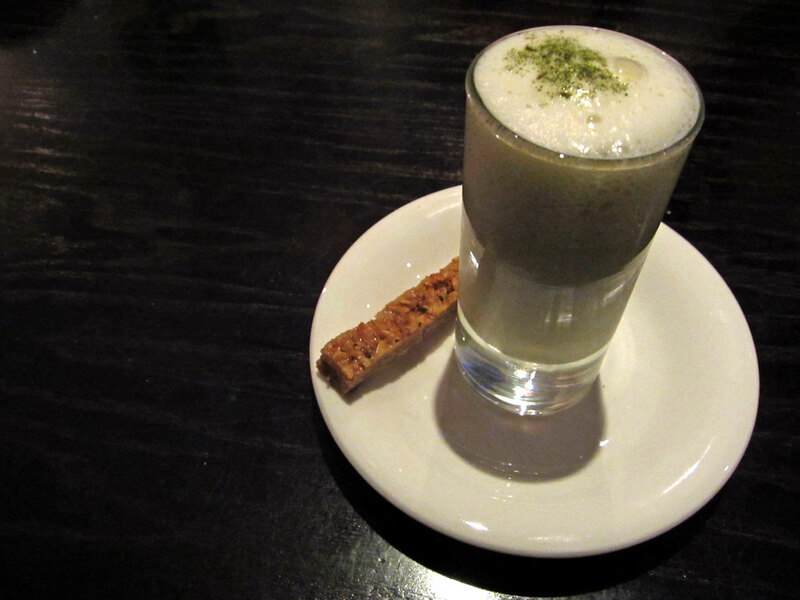 To finish off the meal, we had the affogato al caffe – again just something simple but satisfying. 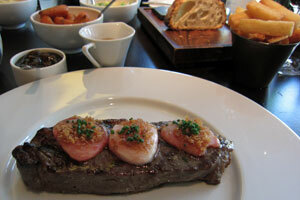 It was a very nice lunch, and considering that the restaurant was new, it had certainly made an excellent start. The only downside I can see with this place is that, because of its high quality of cooking, popular location of Covent Garden and good value for money, da Polpo would be as successful as its siblings, if not more, in the future, and this means that it would be difficult to get in at mealtimes! With the success Heston Blumenthal has achieved in the past 10 years with the Fat Duck in Bray, in 2011 he finally opened a restaurant called Dinner, inside Mandarin Oriental hotel in Knightsbridge, right in the heart of London. It was a much anticipated affair, having planned to open in late summer 2010, and then the date kept pushing back. When the reservation line finally opened, the world went wild to try to secure a table – I was not in a rush to book a table and so I waited until I had the excuse to go…. It didn’t take long though before my “dining” partner-in-crime from Philadelphia, Darcy, notified me of her final schedule for her London trip. As expected, all evening bookings were gone, but I managed to secure a lunchtime booking. I never expected it to be a replica of the Fat Duck, and I would not want to anyway. The restaurant menu was a rediscovery of the dishes from the Victorian era, and many of the recipes were modern updated versions of the dishes described in old cookbooks (I have even found in my local library a recipe book on Victorian cooking that had a list of dishes that looked like the menu from Dinner!). Some of the dishes such as the Meat Fruit were featured on television not long ago. We spent a fair amount of time choosing our dishes but eventually we got there. As for the wine, Darcy asked the “trainee” sommelier for the lighter red wine, and he ended up recommending a Spanish red wine that he described as “full-bodied”. She then asked if there’s any Austrian wine, and he spent a few minutes flicking through the wine list in front of us while saying that there was one, but in the end he couldn’t find the page (or maybe there just weren’t any). At the end, he recommended a bottle of Pomerol which he described as “too young”. We saw a few other tables with the same wine and thought it was probably OK, but he must have been instructed to sell as many bottles as he could. It was not a promising start. 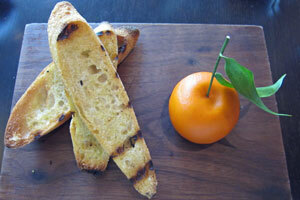 Darcy and I both went for the Meat Fruit – it looked like a mandarin orange outside, but the inside was a very smooth, soft and rich full-bodied flavoured chicken liver parfait, and this was served with grilled bread. Darcy was impressed enough with this that she said she could come back to the restaurant just for this. 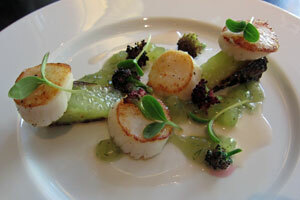 Russell had the roast scallops, which was served with cucumber ketchup and borage – the dish was refreshing and light, even though the scallops were not of the best quality. For main course, originally both Darcy and Russell wanted to have the beef royal. However, that was not available on the day, and so instead they had to settle with sirloin of black Angus, which came with mushroom ketchup, red wine juice and triple-cooked chips. While the sauce was intense and rich in flavour, the steak itself was not so exciting – unfortunately both steaks were over-cooked (Darcy asked for medium, while Russell asked for medium-rare… even by British standard, the medium-rare one looked more like medium verging on to well-done). The triple-cooked chips were disappointing, with very little potatoes in them, and they tasted like thick crisps rather than chips (or fries as the Americans would say). We were not impressed. 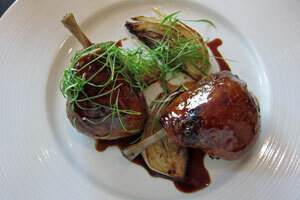 For me, I went for the powdered duck which was served with smoked fennel and potato puree. The duck was tender enough, if somewhat dry, and this was compensated by a rich flavoured sauce. 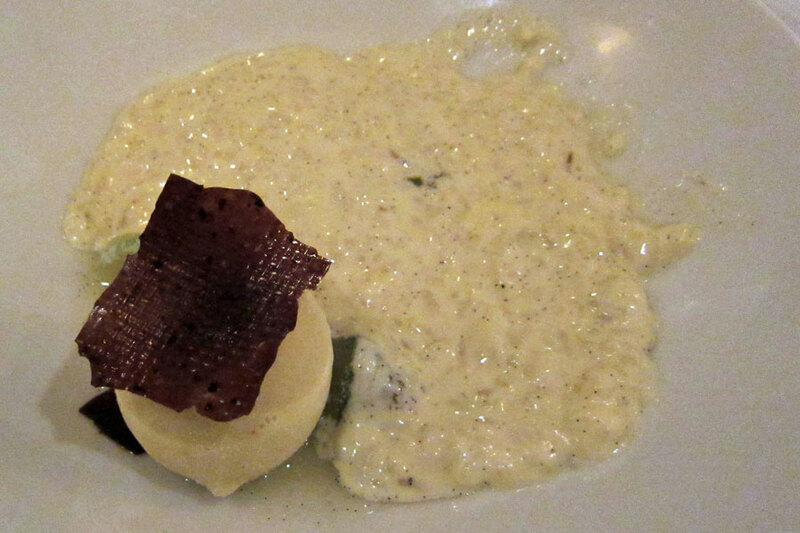 The potato puree was very smooth – I wouldn’t want to know how much cream was added into the potato mash to make this. As for desserts, Darcy opted for cheese instead. 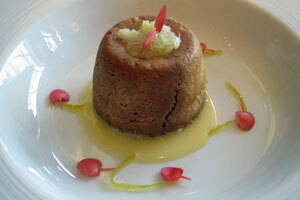 Russell went for the baked lemon suet pudding which was served with caramel and jersey cream. The dry suet encased the gooey soft lemon syrup inside the pudding, and Russell’s verdict was “Heston does one-star dumb down” – interpret that in whatever way you want! For me, I went for the tipsy cake that was served with spit roast pineapple. It was one of those dishes that needed to be pre-ordered at the start of the meal. 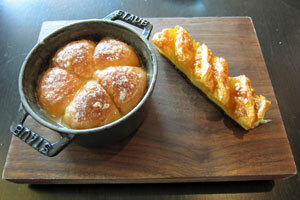 When I took the first bite of the tipsy cake, it reminded me of the pineapple buns (bo lo bao) in Chinese bakeries! In fact, every subsequent mouthful of the cake tasted even more like that. The only thing that distinguished it from the cheap Chinese buns was the roasted pineapplie which was sweet enough but not overpowering, and worked well with the sponge cake. After we left the restaurant, we went for a long stroll at Hyde Park, and we wondered if it was worth returning to the restaurant. It was not long that we came to the consensus that if it was not so difficult to get a table and the price was slightly lower, it could be worth a return trip. However, we were left wondering what the real hype was about. There were some outstanding dishes (eg the meat fruit) but some were off the mark. In terms of “making the noise”, Jason Atherton (formerly head chef at Maze) and his new venture, Pollen Street Social, must be way up there at the top. It was an eagerly anticipated place to add to the London eating out scene, and that’s not surprising given the high standard Maze managed to achieve in the past few years. I was impressed with Maze most of the times – exciting menu, exquisite dishes with food that’s exciting to look at and eat. I had some very memorable meals at Maze, despite my last meal (being the surprise 40th birthday dinner organised by friends) being a bit of a let-down. I had a lot of respect for Jason Atherton and so I was looking forward to going to Pollen Street Social, to see what new level of excitement this talented chef could offer. The restaurant opened in mid-April, and I had the perfect excuse to go there with Russell for his pre-birthday dinner in early-May. It was a decent-size venue – somehow reminding me of a slightly less glitzy version of Maze. It was not full at the time of us arriving, but it was already pretty noisy. After ordering some cocktails, we started studying the menu and debating what to eat. We were told that we could create our own tasting menus as some of the main courses could be served in half portions, allowing for more dishes to be sampled. So that’s exactly what we ended up doing. 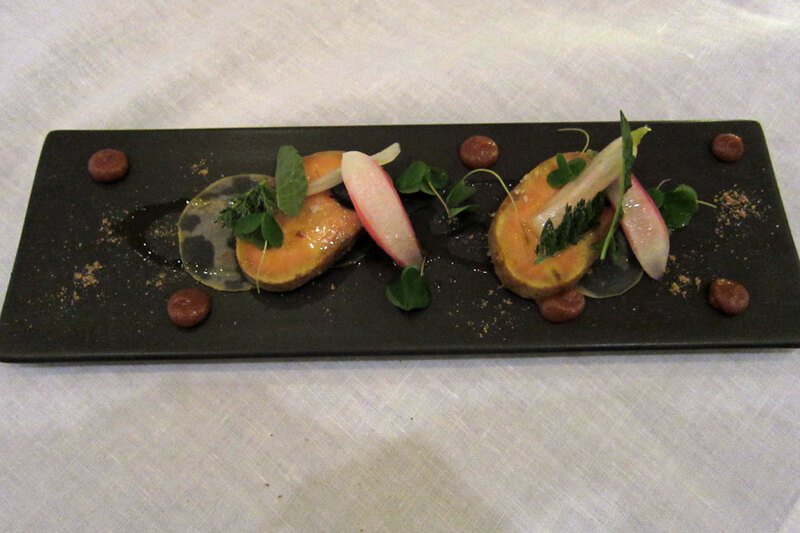 For start, Russell, being a foie gras lover, opted for smoked foie gras with black sesame and smoked golden raisin. That was a no-brainer really. 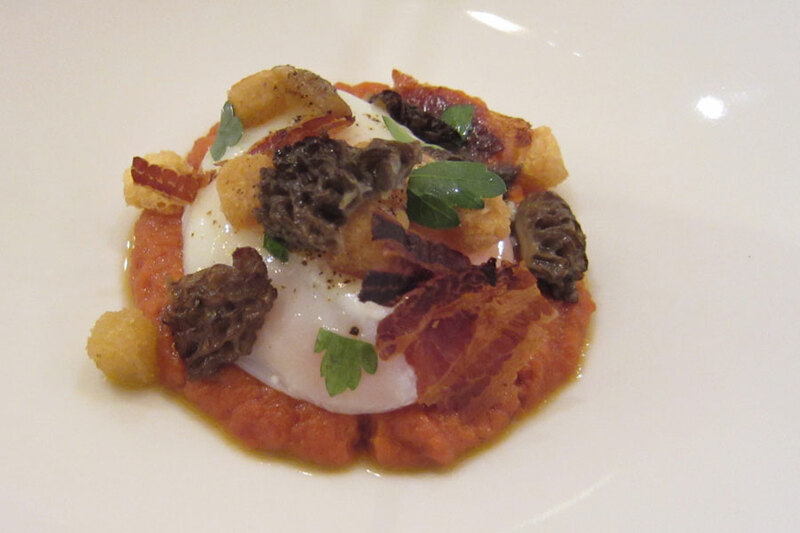 For me, I was intrigued by the “Full English Breakfast” – it was an interesting reconstruction of the ingredients found in a breakfast: poached egg, bacon, tomato sauce, mushroom etc. It sounded more interesting than it looked, and it looked more interesting than it tasted. It was pleasant enough but somehow lacking any wow factors. For the second course, we decided to do a fish course. 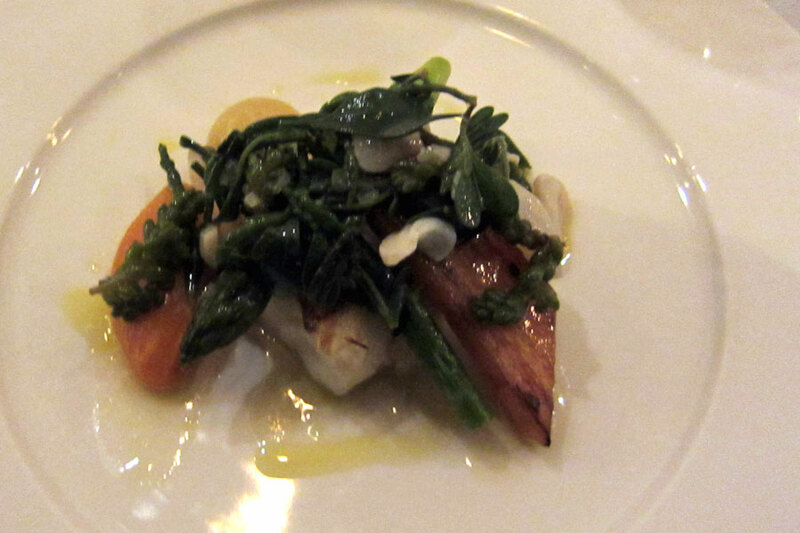 I opted for the roasted cod with sea vegetables, creamed potatoes, lemon peel and English asparagus. I was not sure if the fish was frozen previously – even if it was not, the texture certainly seemed to point to that. 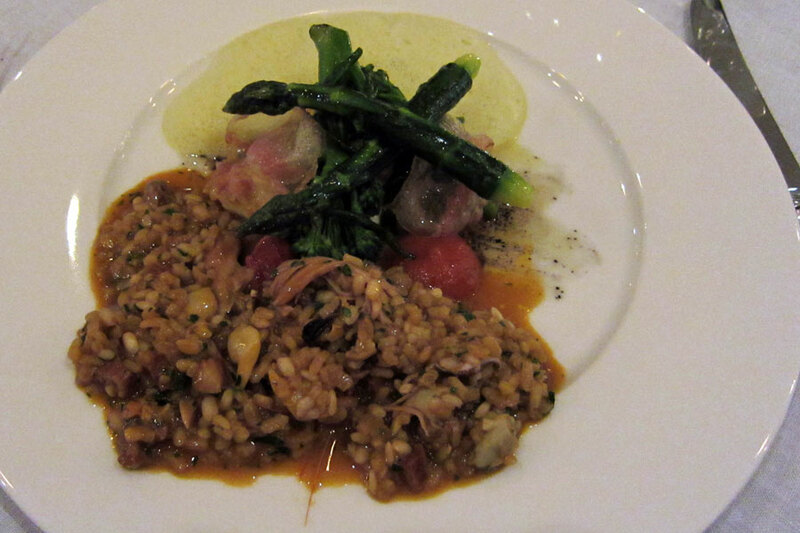 Russell had the roasted halibut, Catalan paella, sprouting broccoli, pork-ham fat and mussel stock. When the dish first came out, it was without the paella and it actually looked nice. But once the generous portion of the paella was piled onto the plate, it actually looked a mess (as in the picture below) – the presentation needed improvement. For the meat courses, the Roasted Dingley Dell pork, beetroot, hops, seeds and grains was on the dry side – another disappointment. 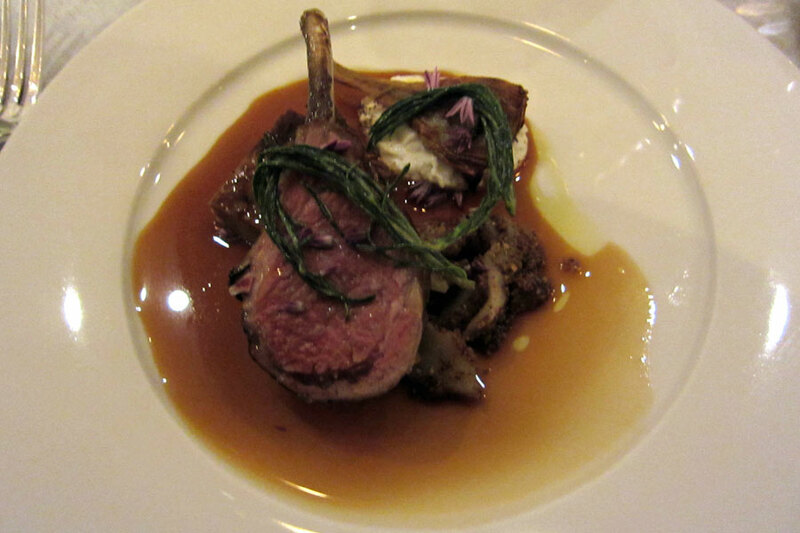 I had rack of Cotswold lamb with braised belly and sheep’s milk curd, which was better, though it was quite a heavy dish. So by the time we finished eating this course, our stomachs felt like they were weighed down by a ton of bricks. 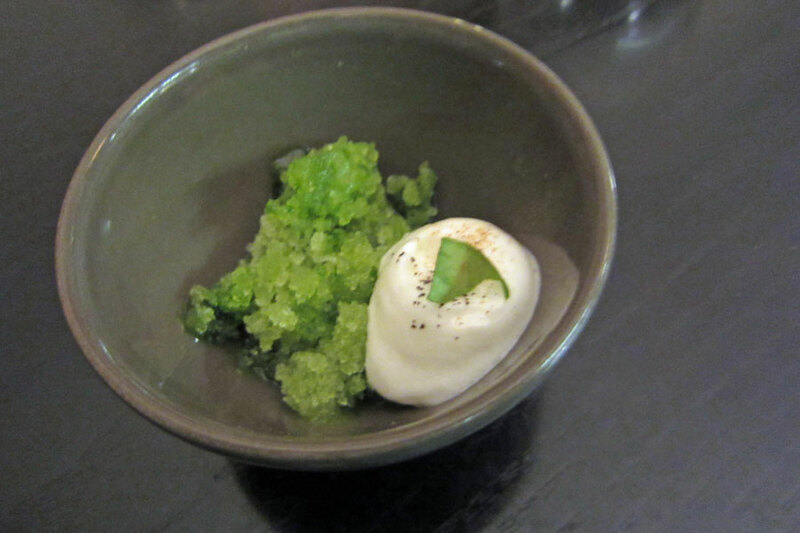 For the desserts, Russell went for the traditional English rice pudding, hay ice-cream and lime jelly. The rice pudding was nice enough on its own, and it did not really need the other ingredients which made the dish too busy really. 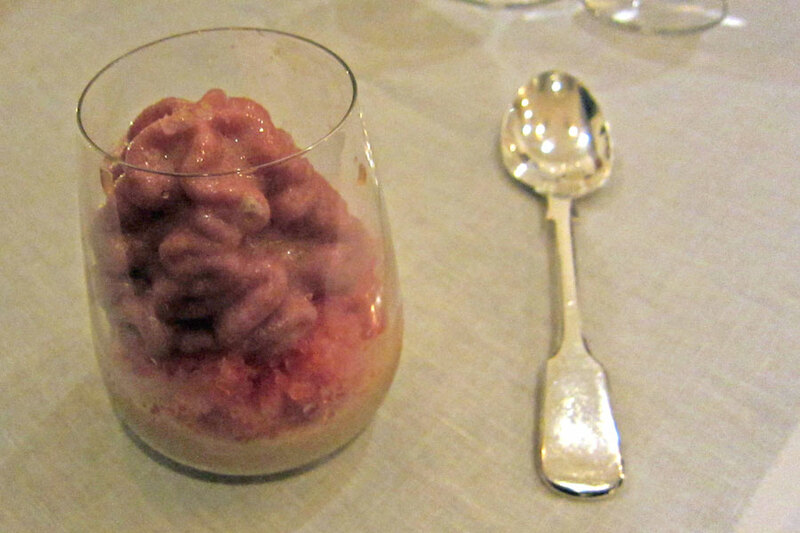 My Sangria mousse, blood orange granita with curd milk jam was very tangy bitterness – to the point where it was not that pleasant as a dessert. I finished it but it’s not something I’d have again. On the whole, we were walked away from the restaurant feeling disappointed. We didn’t expect this to be Maze reincarnated, but we just could not think of anything which would entice us to come back for another visit straight away. The restaurant could just be trying to find its feet still – Maybe we would give it another try after 6-12 months. One really nice thing to have visitors from abroad is that I can have a perfect excuse to eat out and try out new restaurants. So when my godparents from Melbourne informed that they would want to meet up for lunch on Sunday during the bank holiday weekend in May, I was trying to think of a place that would not only just serve good food, but somewhere with a bit of character. With the Gilbert Scott and the St Pancras Renaissance Hotel just opened not long ago, I decided that it could be an interesting place to go. I used to go to St Pancras station a lot when I was travelling between London and Nottingham back in the early 1990s, and I always wondered why there was such a magnificent building that was left empty and derelict. So I was sufficiently excited when I learnt about the major renovation and the re-birth of the hotel next to the station. Somehow I did not pay much attention on what was on offer in terms of food there until pretty recently, when I learnt that Marcus Wareing was branching out and opened the Gilbert Scott in this magnificent building. Before going to the restaurant, I warned my godparents that I couldn’t guarantee the standard of this restaurant: (1) it’s only opened a few weeks ago and like most restaurants, I’d expect a list of teething problems; (2) I have not been until this point, and so have no idea what it would be like and (3) I was not that impressed with Marcus Wareing’s restaurant at the Berkeley and I feared that this place could be just another one of those London hypes. We were the first to arrive at the restaurant at lunchtime. The high ceiling and the decor of the dining room certainly seemed to have transported us back to the grand old days of railway travels – it was a very classic design that reminded me of some of the classic restaurants on continental Europe. The classic theme carried over to the menu, with many of the classic British dishes but with an updated twist featured on there. 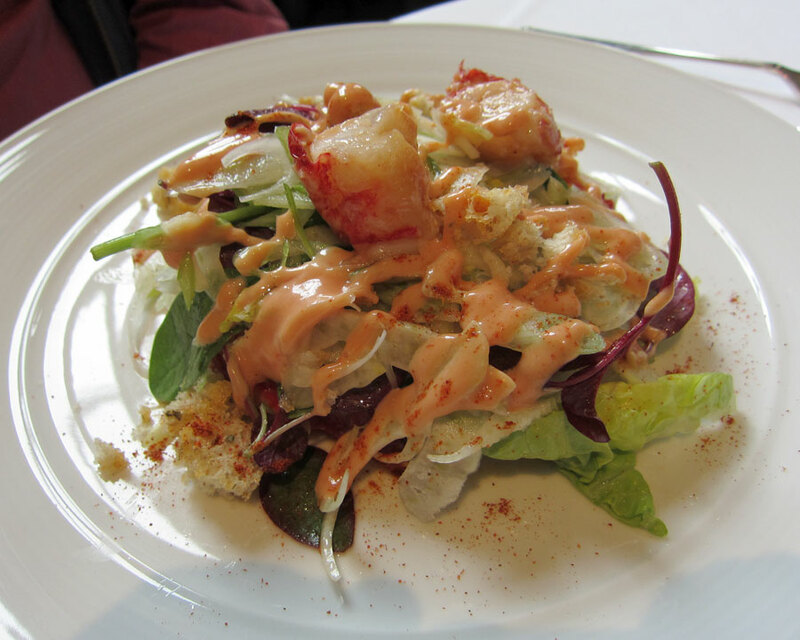 Titus chose Cornish lobster salad, with baby gem, Marie Rose sauce, fennel and lobster oil – he’s a big fan of lobster and there’s no shortage of the fresh crustaceans down under. However, he thoroughly enjoyed this fresh salad. Flora and I both opted for the Dorset crab (brown and white crab) with pear and hazelnuts. 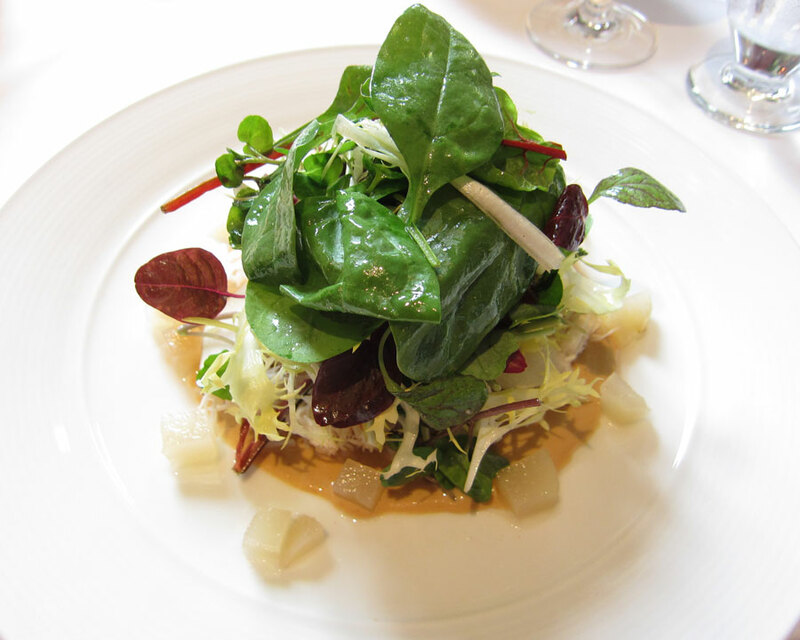 The dish was delicious to look at, and there was a generous serving of the crabmeat underneath the tower of salad leaves. It’s a light and refreshing starter. For main courses, Titus, after overcoming the superstition of the word associated with deaths and funerals, chose soles in coffins (lemon sole) with vermouth cream, Morecambe bay shrimps, mace and crispy potato. None of us knew what “soles in coffins” was, so we enquired. It was a play on the words “souls” with “soles”. But rather than the classic way of the fish being placed inside a scopped out potato, in this dish the fish was rolled up and placed on a bed of potatoes here. It looked elegant and Titus was glad to have made the choice and forgotten his earlier hesitation on the dish just because of the name! 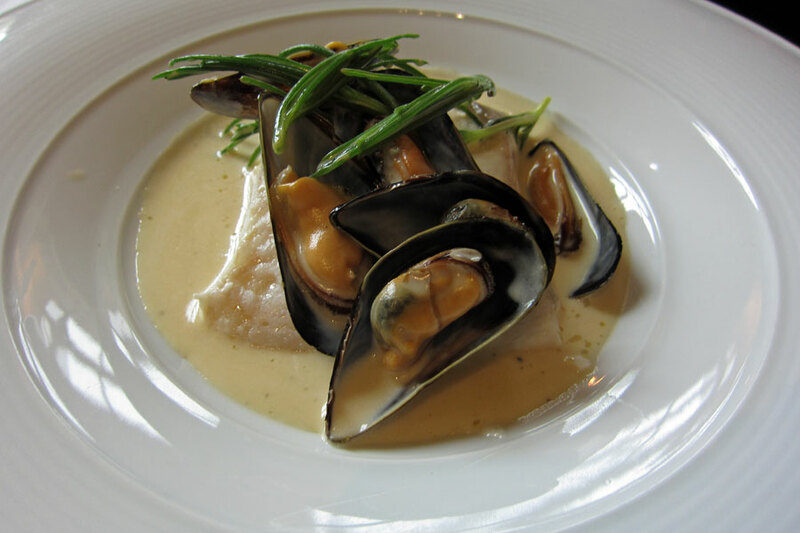 Flora had Scottish halibut poached in Camel Valley brut with mussels. I told her that I learnt about Camel Valley vineyard in Cornwall when I was dining at Nathan Outlaw’s restaurant in March, and that I fell in love with the sparkling wine. With her small appetite, Flora gave me quite a sizeable chunk of fish and mussels to try out – the fish was fresh and cooked to perfect timing. 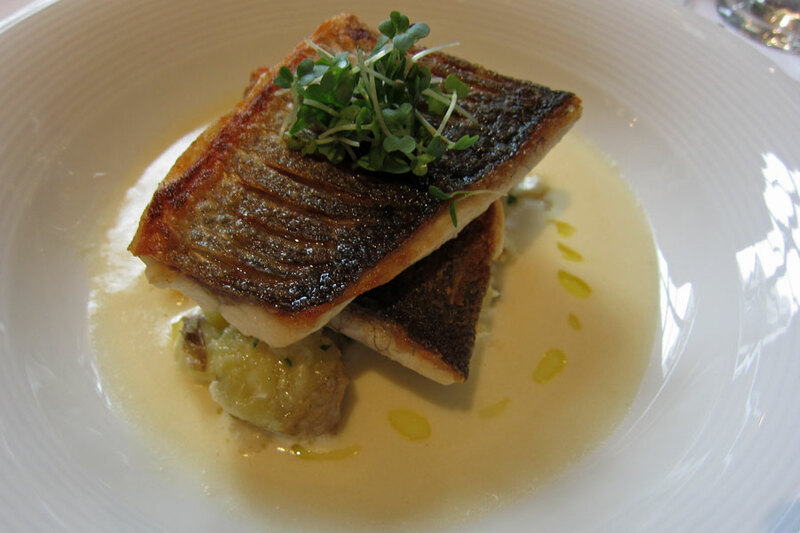 For me, my main course was pan-fried Cornish seabass, Cullenskink (smoked haddock) and potato sauce. 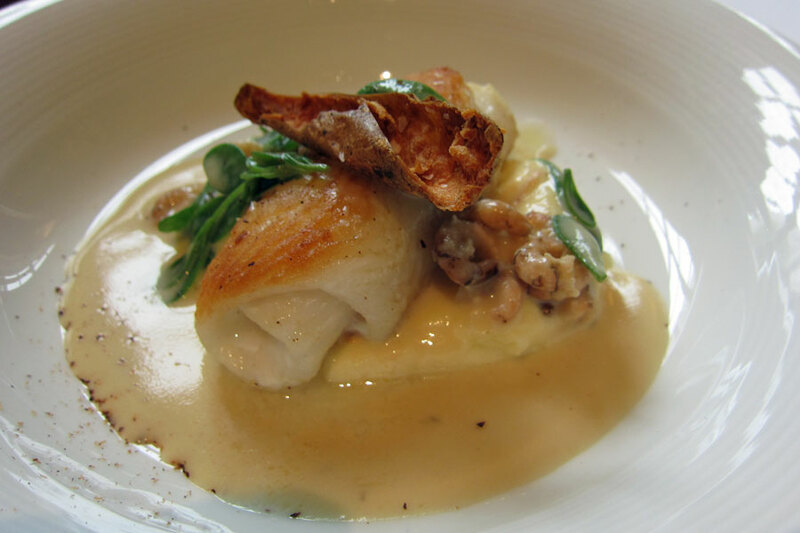 It was rich in flavour but without overpowering the flavour and texture of the seabass. After the main course, we had the difficult task of choosing the desserts. There were so many classic British desserts that I could have gone for (Bakewell tart, apple amber pudding, trifle etc). 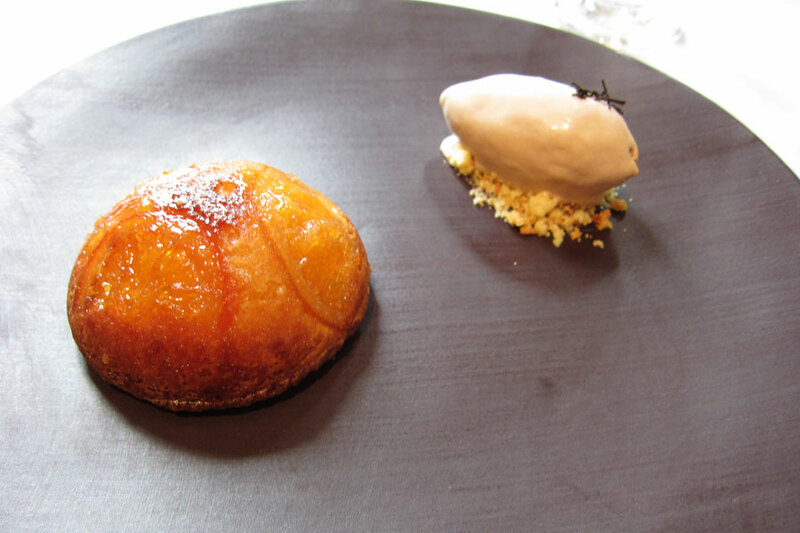 But in the end I opted for the orange marmalade jaffa cake with Earl Grey tea ice cream – the jaffa cake was moist and sticky, while the ice-cream actually neutralised some of the ultra-sweetness of the cake. I could have easily have eaten another one. 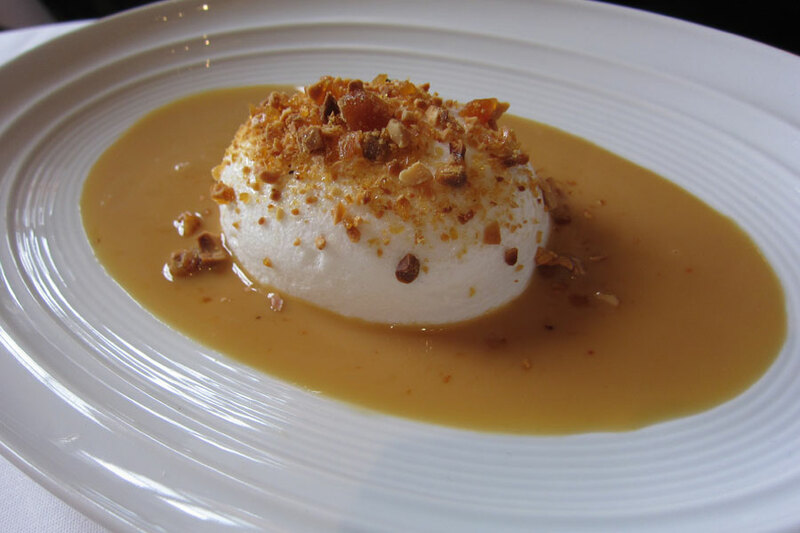 Flora was already so full that I suggested that she should try Mrs Beeton’s Snow eggs with Everton toffee, peanuts and burnt honey custard. I managed to try a mouthful of this and it was a mixture of sweetness and saltiness, and softness and crunchiness. Titus went for the Lord Mayor’s trifle (pineapple, coconut, rum) which would be my other choice of dessert. It was full of pineapple but he said that there was a lack of coconut and rum flavour. Ah well, maybe next visit I’ll have this and see for myself. There have been a few restaurants that opened in London in the first few months of 2011 that have attracted a lot of attention: Dinner by Heston Blumenthal, Pollen Street Social by Jason Atherton, and The Gilbert Scott by Marcus Wareing. I must say that out of these three, this was the most enjoyable, and one that’s definitely worth going back. In the beginning of May, my godparents, Titus and Flora, from Melbourne sent me an e-mail saying that they would be in London at the end of the month and asked me to book a few restaurants for them. As Titus loves his food and he like searching out for good food; while Flora has only got a small appetite, I had to be careful on the choices. Texture seemed to fit the criteria as I remember from my visit in the summer of 2010 that the meal was not heavy due to the lack of the use of butter or cream in the cooking, and the cooking was exceptional. Luck was on my side also as I managed to secure a table for the Friday evening before the long weekend. After we settled down at our table, it took us ages to decide what to have. We were debating between the tasting menu and the Scandinavian fish tasting menu first – the former had quail and beef which Flora couldn’t eat, so she was veering towards the fish tasting menu; while Titus was happy with the normal tasting menu. For me, I was actually quite happy with either menus and also a la carte, but I guess the elders always thought that the younger generation (ie me in this case) could eat a lot! 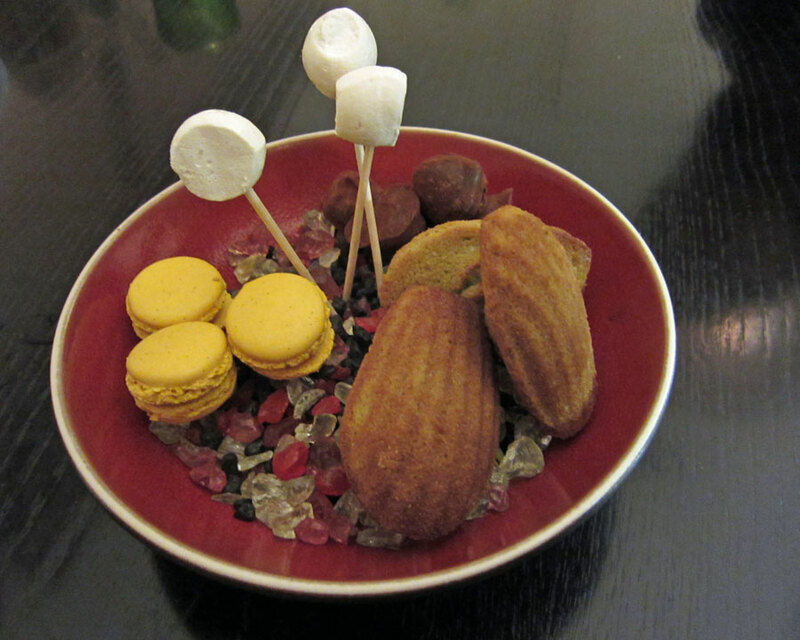 Ideally we would have liked to have a mixture of the two tasting menus but the restaurant manager told us that due to the “complexity” of the dishes, the whole table had to take the same tasting menu. Then we spent another ten minutes debating on the a la carte, and finally settled on the Scandinavian fish tasting menu! 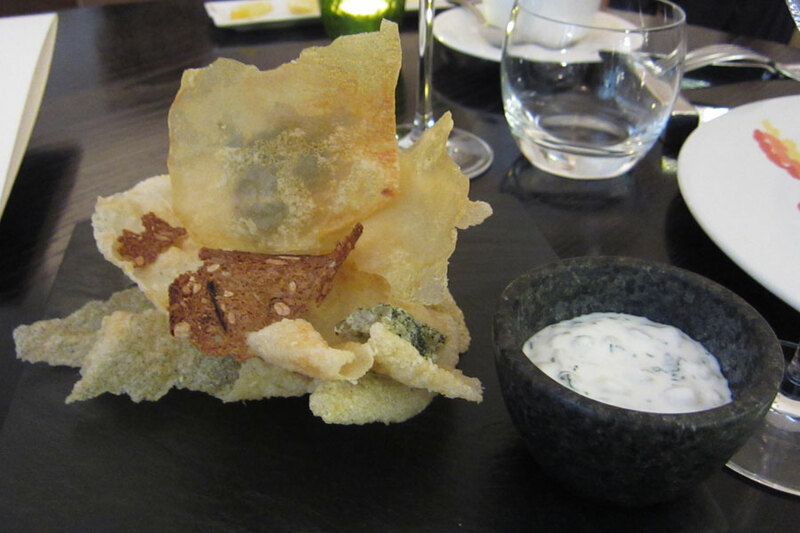 The nibbles came soon after we got our aperitifs – a mixture of crisps. The one that got Titus talking was the cod skin crisp, as he didn’t expect to see this in a Western restaurant – and he started telling me about the use of fish skin in various Chinese congees. It didn’t take us long before we finished the whole plate of crisps. 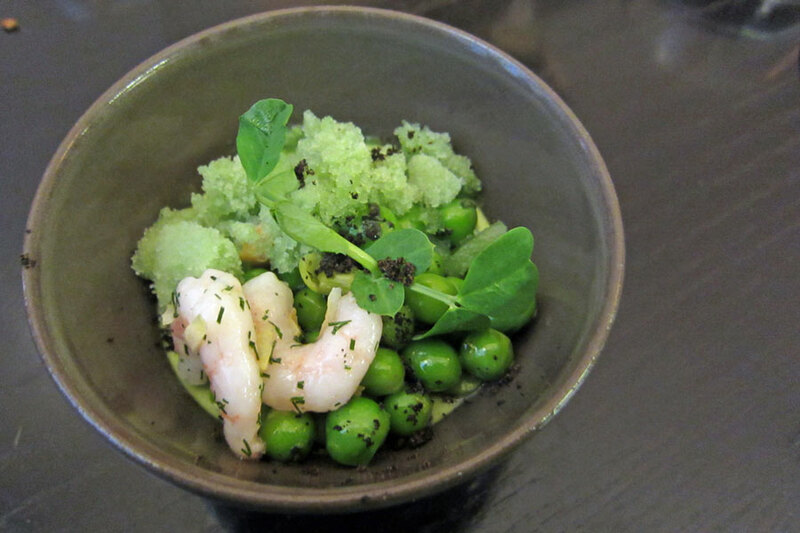 The appetiser was pea mousse and mint “snow” with prawns. It was a very refreshing dish – each mouthful was a delight, with a contrast of the texture of the various ingredients, and the explosion of flavours in the mouth. A very effective palate cleanser. 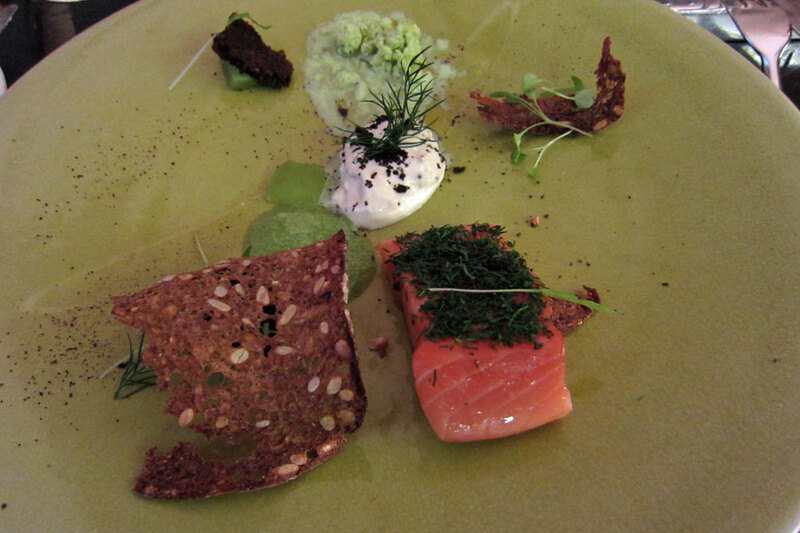 The next course was smoked organic salmon (graflax) with horseradish. The salmon was lightly cooked and the flesh was still firm, contrasting well with the soft mousse and the crisp bread that accompanied the dish. It was a very promising start, and Titus was already happy. 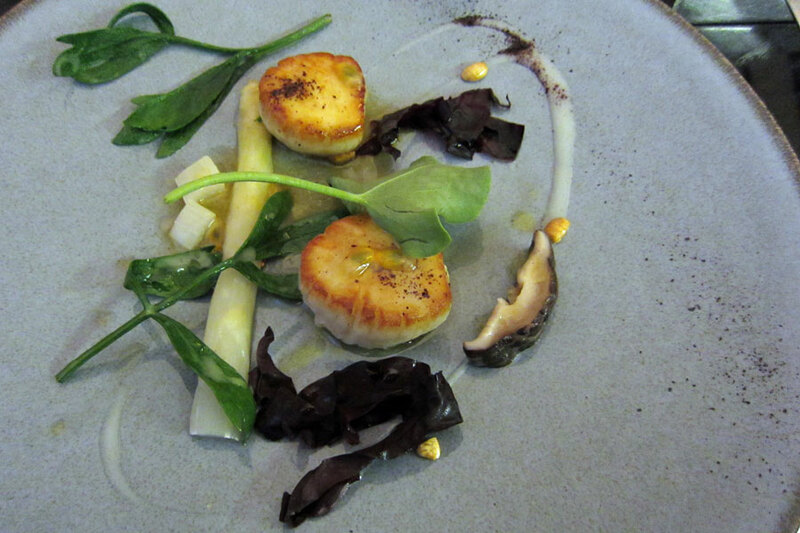 The next dish was roasted scallops with white asparagus, passion fruit and söl. Another dish that tasted as beautiful as it looked – the scallops were fresh and cooked through nicely, and the use of passion fruit and vinegar lifted the flavour out well. Söl (dulse seaweed) gave the extra interesting dimension to this dish. Another dish that we all enjoyed that we could have easily had second helpings! 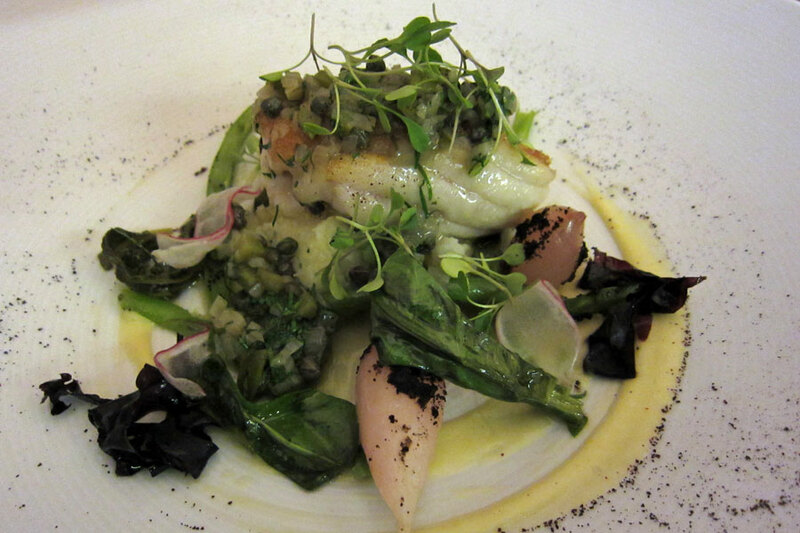 The main fish dish was Cornish skate with cod brandade, lemon, radish and garlic oil. There was a generous serving of fish on this dish, and once again the fish was fresh and perfectly cooked. I love brandade, and this went well with the rest of the dish. Titus was somewhat surprised by the high quality here, and I explained that not many London restaurants (even the seafood ones) could cook fish to this standard. 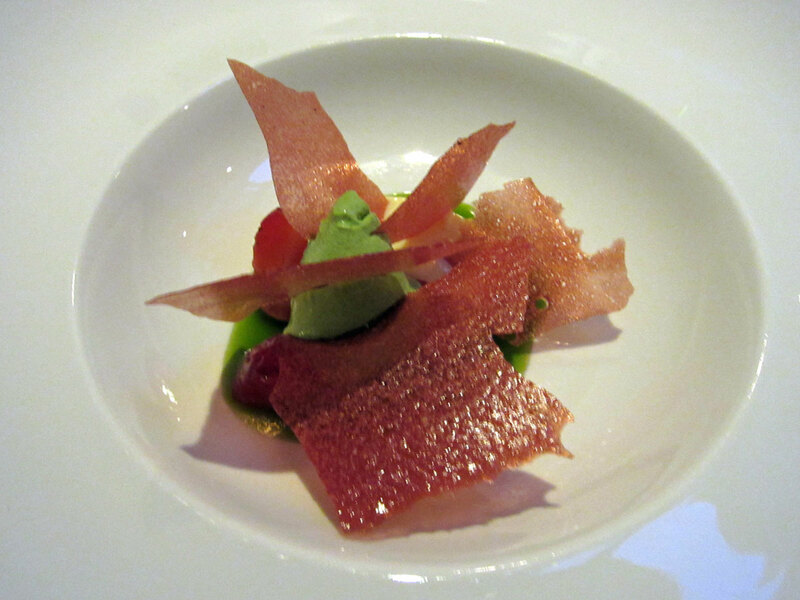 Pre-dessert was sorrel sorbet with muscadet mousse – another very refreshing and effective palate cleanser. It was so nice that Titus said that he could easily have had four of these! 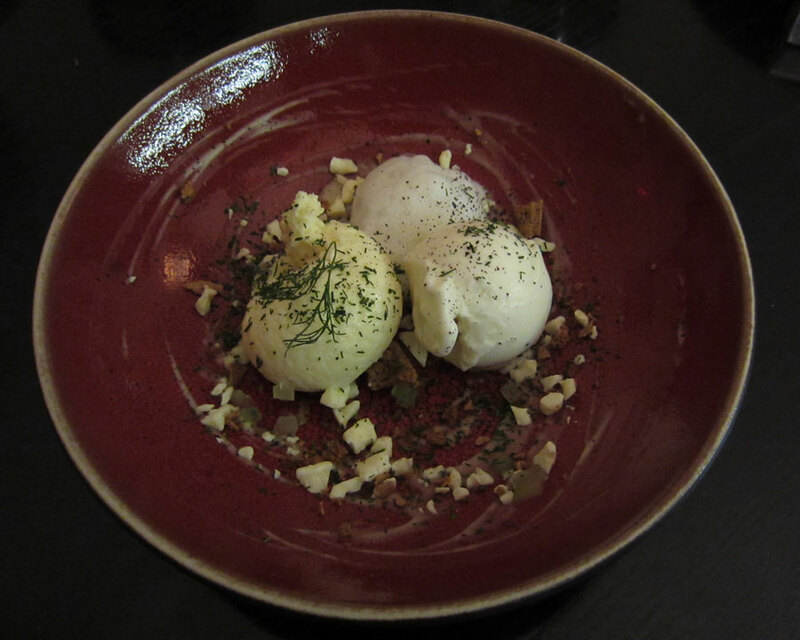 The dessert was something I was not so keen on when I saw the menu – Valrhona white chocolate mousse, ice-cream with dill and cucumber. Not being a big fan of white chocolate, I thought I’d struggle even when it’s Valrhona chocolate, as many restaurants ended up with very sweet white chocolate desserts. So I was pleasantly surprised when the dessert not only looked nice, but tasted absolutely wonderful, without being too sweet. The various textures of the ingredients (from the silky softness of the foam, to the soft mousse, moving to the slightly harder ice-cream and cucumber cubes, all the way to the sprinkling of the nuts on the plate) worked so well together – it was a perfect way to end the meal. On the whole the meal was just how I remembered it from last year – the ingredients were of a high quality and the cooking was beautifully executed, and the meal was filling but light. The lack of use of butter and cream-based sauces really helped in letting the ingredients speak for themselves. This was the exact reason why my godparents and I enjoyed the meal so much – there’s nothing that beat fresh ingredients, rather than disguising the inferior quality food in some heavy sauces.